No one said being a food truck owner was going to be easy. After all, there are so many things mobile kitchen owners have to overcome, and these obstacles, if you will, will start rearing their heads the moment you decide to become a food truck owner. With that in mind, below you will find 10 things food truck owners have to overcome. If you are new to the food truck industry or are wanting to join in the future, then just look out for these things. If you are a current owner and have been a food truck chef for quite some time, then you can probably relate to some of these obstacles. Believe it or not, the naysayers will start sprouting up the moment you decide to join the food truck industry … and that trend will likely never stop. We just want to say this: Don’t let the naysayers win. The only thing they want to do is bring you down with them. They do not want to see you succeed and they surely don’t want to see your food truck become a major success. Unfortunately, naysayers can come in the form of customers, reviewers, friends, family members, etc. The key? Start cutting negative people out of your life. Stay focused on the task at hand and do everything in your power to become a success in the mobile kitchen industry. No matter what industry we are talking about, there will be naysayers. Unlike naysayers, you can’t just avoid unhappy customers. You actually have to solve the problem and make sure said problem doesn’t happen again. If it does happen over and over again, then you can expect bad reviews to come flying in (and you might even lose customers on top of that). There are many ways to deal with unhappy customers, and everyone’s strategy to this obstacle is different, but this article should help. Unfortunately, there’s not much a food truck owner can do about this one. If the weather is bad, then it could force your food truck to be closed for the day. With that said, there are things you can do when the weather is bad if you do decide to stay open, such as serving hot drinks to warm people up and things of that nature. Of course, this is up to each individual food truck owner. If you don’t practice proper food truck maintenance, then don’t be surprised when something happens to your mobile kitchen. It could be something as small as a flat tire, or it could be something major with the engine. Whether the case, not following proper food truck maintenance could lead to your food truck being in the shop, and while that is going on, your business won’t be able to make money. This might be something many food truck owners don’t even want to think about, but it is something all food truck owners need to overcome, and it also can be avoided in some cases if you take care of your truck. Sales are likely one of the biggest issues food truck owners face. Sales (aka making money off of your customers buying your product, which is your food) will keep you in business when they are thriving, and they will threaten your business when they are plummeting. Everything revolves around sales. You have to continue making your product better to attract more customers which will lead to more money. Likewise, you have to continue implementing new strategies along the way to many different areas of your business. 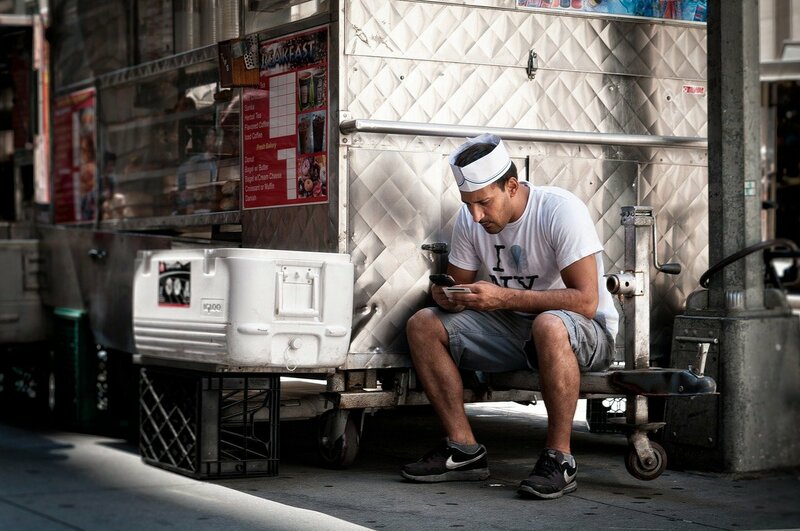 Sales, more likely than not, are on every food truck owner’s mind. This is quite the challenge for many food truck owners to overcome, for not everyone is used to spending every waking moment working on their businesses. If you want to be a successful food truck owner, then you are likely going to have to put in a ton of hours for an extended period of time. You might be able to rest eventually, but this is not a get-rich-quick scheme, and many owners seem to work double-digit hours for five to seven days a week. Even if you do work that many hours, that does not mean you will succeed. Running a successful business takes hard work, determination, skill, a good product and some luck (among other ingredients). So many things have to go right for your business to survive, thrive and grow. At the very least, most owners put in a lot of hours at their food trucks, so just be prepared for your life to change — and this could, of course, be a good thing if this is what you really want to do for a living — if you plan on being a successful food truck owner. This is something people have to overcome in any profession. Complacency could lead to you not growing, and it can surely lead to you not getting any closer to making your dreams come true. In its simplest form, complacency could lead to you going through the motions and not doing your best work. When you are doing the same exact thing every day (and at the same time, although that is not the case for everyone), it’s hard not to get complacent. That is why you need to keep things fresh, new and exciting at your food truck business. Yes, it really does take a lot to succeed as a business owner. If you really love what you do, and many mobile kitchen owners do, then you might not deal with complacency … but many owners do deal with this obstacle, whether they love cooking food for a living or not. Competition is always going to be there, whether it is friendly competition or not. There are so many food trucks in America, and if you are in a good location, then there are probably other food trucks near that same location as well. Therefore, competition could hurt you when a competitor lowers or raises his/her prices, incorporates a new meal, adds a delivery service or whatever it might be. That is why it’s important to study the competition on a routine basis and to always be thinking of ways to stay ahead of the competition. Of course, that is something that is easier said than done. You started a food truck business, but what do you do next? Your business is thriving, but what do you do next? You landed a catering gig, but what do you do next? You opened up a second food truck, but what do you do next? This is a question you will likely always be asking yourself at your food truck business. That is something you have to figure out on your own, and in many cases, it is a good problem to have. This might sound like a joke to many food truck owners, but staying passionate about your food truck career might be easier said than done, and that is especially the case if you are struggling in the form of customers and sales. You might figure out that you don’t like cooking at your truck every day. You might hate the process that is driving your truck. Regardless, things happen throughout our lives and our passions and dreams change as a result. This is something that can — and will — happen all the time, whether it is for better or worse. If you are losing passion for your career, then you have to think back to when you wanted this dream to happen so bad. What were your motivations then? Why did you want to become a food truck owner in the first place? You might battle with this obstacle over and over again, and that is okay. If you really want to be a food truck owner, then you will keep the dream alive, and you will always think of new ways to make your situation better. Nonetheless, there are many obstacles that food truck owners have to overcome, and we wish you the best of luck during that process and during the process that is making your food truck dream a reality!